Wallet guide coming soon! For now, check out our other diamond resources or contact us for additional information! A carat is a measurement used to signify the weight of the diamond. It is the most precise of the four C's. Diamonds are weighed in metric carats; one carat equals 1/5 gram or approximately 0.007 ounces. It takes a little over 142 carats to equal 1 ounce. Every carat is divided into 100 points. Therefore, a 50-point diamond is also called a ½ carat. Diamond weight is so precise that polished diamonds are weighed to a thousandth of a carat and then rounded off to the nearest hundredth (point). Diamonds weighing less than 20 points are often called melee. Another term often used is the term grain, or grainer. A grain equals one-quarter (0.25) of a carat. For example, a 75-point diamond would be called in the trade a three grainer and a one-carat stone may be called a four grainer. Loose stones are weighed directly on a scale but mounted stones can only be estimated by plugging their measurements into a mathematical equation. 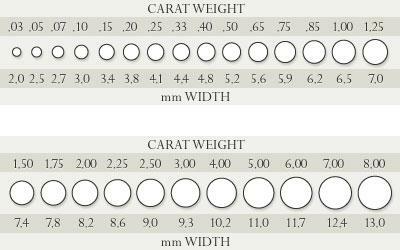 Another quick way of estimating mounted round diamonds is by measuring the diameter of the diamond and comparing it to a size chart.